The development of business analysis as a professional discipline has extended the role of the business analyst who now needs the widest possible array of tools and the skills and knowledge to be able to use each when and where it is needed. 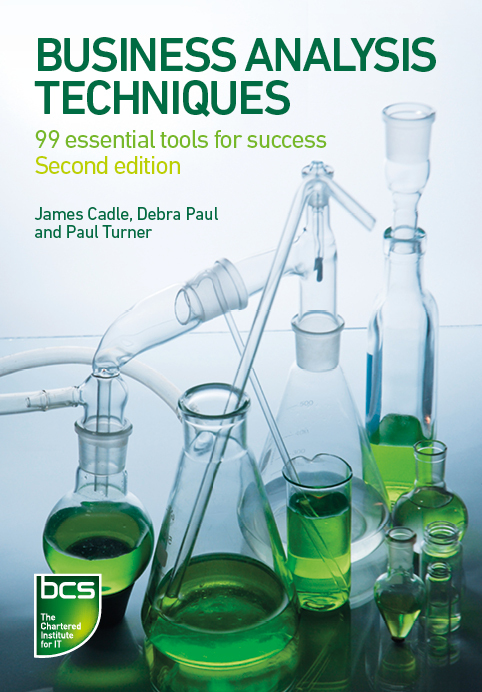 This new edition provides 99 possible techniques and practical guidance on how and when to apply them. It complements Business Analysis also published by BCS, and offers a more detailed description of the techniques used in business analysis, together with practical advice on their application. James Cadle has been involved in business systems for 35 years, in the public and private sectors, and is now a director of Assist Knowledge Development. Debra Paul is Managing Director of Assist Knowledge Development and was a founding member of the BA Manager Forum. Paul Turner is a director of Business and IS Skills and of Assist Knowledge Development, specialising in the provision of training and consultancy. Postscript – which techniques do I really need? An excellent compendium of BA techniques packed with useful examples. BAs at all levels will discover something new. This book should be essential reading for all business analysts. Even after 30 years working in this field, I find it an immensely valuable reference. Excellent!